EXCLUSIVE: Buy one entree, get one FREE on Tuesday only with our Deal of the Day! You can get buy one, get one free bowls at Thai Chili 2 Go. We are spicing things up with this Smart Shopper Deal of the Day! 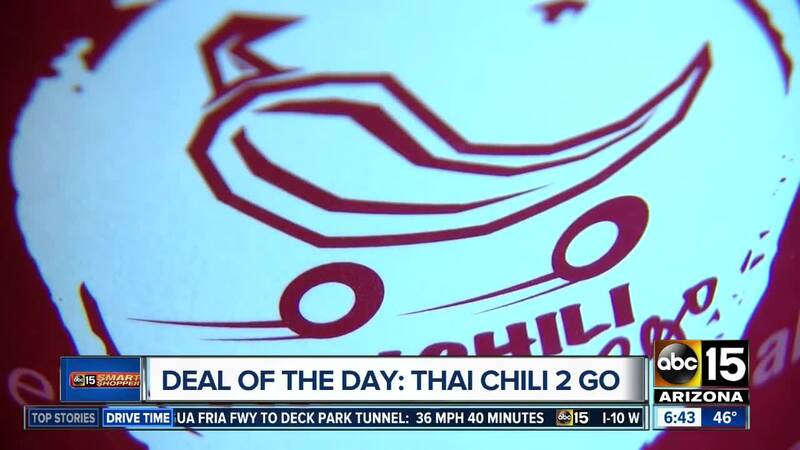 Check out Thai Chili 2 Go ! It's quick-serve and fast-casual Thai and curry grub! On average, a dish takes about three minutes to prepare. Everything is customizable with fresh ingredients. Entree prices are either $9 or $10. There are five East Valley locations, and all of them are teaming up with us for a Smart Shopper Deal of the Day. All day Tuesday, February 12, it will be buy one entree, get one free when you mention 'Smart Shopper' at the counter! You can either dine in or take your food to go. There is a limit of one per guest, but still, you're getting double the food for half the price! Our Deal of the Day cannot be used for delivery or combined with other promos. You must order in person and mention 'Smart Shopper' to get the deal. It cannot be called in.